There are just a few communities around the nation loosely following principles once known in the construction industry as New Urbanism. 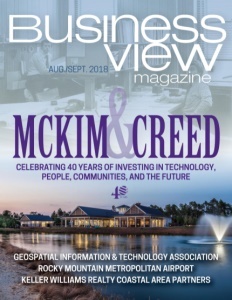 Pioneering developers and builders involved in Florida’s sustainable communities have stepped up, creating new green neighborhoods, villages, and towns, promising a lifestyle that will literally not cost the earth. This philosophy, first extolled in the 1980s, advocated small settlements of a limited number of residences with a clear neighborhood “center” and an appropriate number of schools, parks, retail, and facilities. 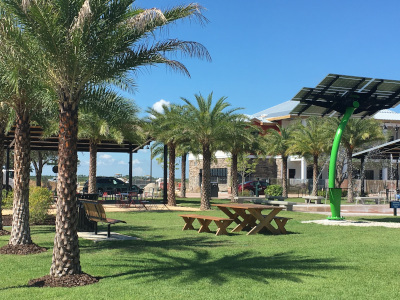 Most recently communities certified Florida Green by the Florida Green Building Coalition (FGBC) have raised the bar for sustainability and resiliency. With over 17,600 certifications since being founded in 2000, FGBC is by far the largest certifier of green homes, residential communities, and local governments in the state. Alys Beach, Babcock Ranch, Lakewood Ranch, and Green Key Village have all gone Florida Green. Unlike other national and international certifications, FGBC are only standards developed with Florida-specific criteria. They address Florida’s hot-humid climate, environment, unique topography, and natural disasters. “The benefits of sustainable transportation, renewable energy, recycling, clean water, urban forests, and the like certainly help to make a more livable community and help to hold global climate change at bay,” noted FGBC President Jeremy Nelson. Using the traditional town as the model, Alys Beach, located along Scenic Highway 30A in Northwest Florida, is a healthy mix of homes and buildings and a well-connected street network making travel by foot and bicycle the preferred way to get around. All homes are required to be third-party certified as green homes by the Florida Green Building Coalition. Alys Beach was the first community in the state to do so. One of Alys Beach’s most visible features is the palette of white roofs and walls—an adaptation to the local environment that reflects much of the sun’s heat and helps keep the town cooler Cool roofs and walls hint at more green features inside homes, where a host of measures like spray foam insulation, long-lasting materials, and efficient appliances help to conserve water and energy, and increase durability. Parks and streetside landscapes are plentiful, featuring mostly native plants that are adapted to local conditions, reducing the need for water, fertilizer, and pesticides. These and other community-wide environmental features are aesthetically pleasing and create a sense of community. Located along the Charlotte County-Lee County line east of State Road 31, most of Babcock Ranch will remain a nature preserve, forever. Green infrastructure has been the overriding theme in all planning decisions for the sustainable community. Natural surface-water flows are essential because they help restore natural habitats and provide natural irrigation. Florida Power and Light’s Babcock Ranch Solar Energy Center will supply the community and the region with 74.5-megawatts of clean, renewable power. The 443-acre solar power plant will make Babcock Ranch the world’s first new town where solar energy production exceeds the total energy consumption from day one. 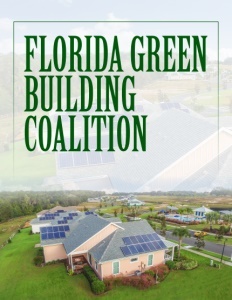 Because of its emphasis on environmental stewardship and renewable energy, Babcock Ranch builders adhere to Florida Green Building Coalition green-building standards. Homes have raised foundations for natural cooling, high-performance windows and insulation, efficient heating and cooling equipment, and energy saving lighting. A truly green home meets certain standards for energy efficiency, healthy air quality, use of local, sustainable building materials, tight insulation, water management, and other criteria. Sustainability is the town’s hallmark. Autonomous shuttles and electric vehicles will be key to getting around. The town is expected to eventually have 19,500 homes and 50,000 residents. Located on Florida’s west coast in Manatee and Sarasota Counties. An early advocate of Florida Green, this sustainable and growing community has been certified by the Florida Green Building Coalition. Land is set aside for open space with miles of trails for walking, biking, and multiple recreation activities including golf, tennis, polo, cricket, and dozens of clubs and activities for residents. Points are awarded by FGBC for each of the individual green certifying levels, limited to bronze, silver, gold, and platinum. Builders accumulate numerical points for selecting and integrating individual environmentally-friendly, green products and sustainable techniques from a menu of available green options. Homes are visited, reviewed, and certified by a third-party green verifier. Each of the green certifying levels is upgraded, expanded, or improving, on the green certification designation. Commercial business parks include fiber optic lines, natural gas service, and non-potable reuse irrigation water systems. Business Park locations are carefully planned around historic Florida ranch land providing wetland protection, and environmental stewardship. Green Key Village is just a short drive from Ocala and Orlando in Lady Lake. The goal of Green Key Village is to combine “old Florida charm” with “new green living.” Each home and design is fully sustainable as defined and certified by the Florida Green Building Coalition and the Home Energy Rating System. All the homes include the most energy-efficient designs and technology, considering the individual home’s build, geometry, and design as well as specific location. Features include solar panels, sustainable materials, and net-zero energy build. 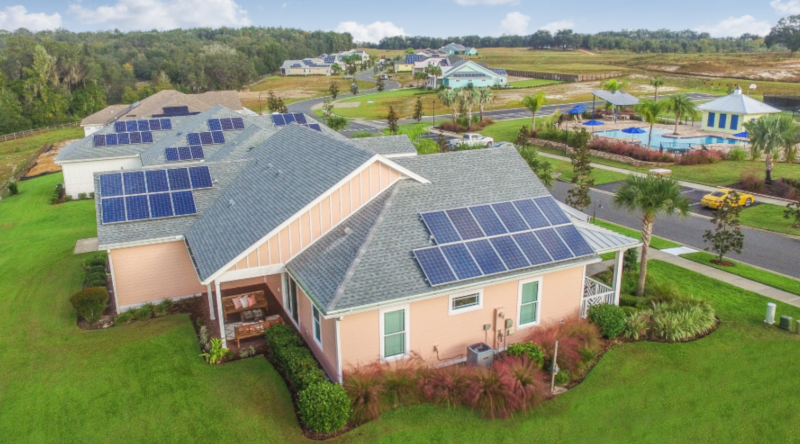 Florida Green Key Village uses photovoltaics to capture the power of the sun. Not only are the homes solar powered but all the community amenities are powered by photovoltaics. Green Key also promotes healthy living. The health of the homeowners is a high priority for developers. They utilize energy recovery ventilators and high filtration to deliver clean air. The homes incorporate healthy eco-friendly materials such as flooring, insulation, cabinets, paints, and adhesives that are all low-emitting. In addition to Florida residential communities, cities and towns that want to be known as green communities can do so through the FGBC green standards for local governments in the state. “Creating sustainable places that address long-standing concerns — adapting for climate change, promoting environmental justice, incorporating a mix of housing types — remains a significant challenge for leaders engaged in the planning process,” said FGBC Executive Director C.J. Davila. FGBC’s five certifications provide pathways to build green homes, developments, local governments, high rises, and commercial buildings. The process, including low builder fees, is often more affordable than other certifications. The free market aspect of FGBC certifiers keeps costs low. For more information on Florida Green communities contact the Florida Green Building Coalition at info@floridagreen.org, visit www.floridagreenbuilding.org, or call (407) 777-4919. Mike Bonts is on the board of the Florida Green Building Coalition, a member of FHBA and president of Mike Bonts Public Relations, a Jacksonville, Fla. based real estate PR and brand development firm for builders and developers. Check out this handpicked feature on “Building Industry Groups to Streamline Tools and Development”.